The crest is that of Hector John, 2nd Earl of Norbury (1781-1839). 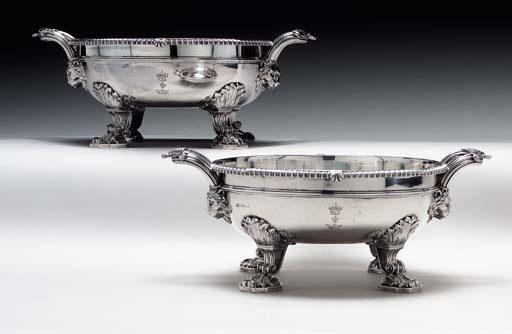 The 2nd Earl appears to have ordered an extensive silver service from Paul Storr in 1813, as evidenced by several objects engraved with his crest and coronet which have sold at auction in recent years. An entree dish and cover from this service sold at Christie's, New York, April 20, 2000, lot 200. A matching pair of vegetable dishes sold in the same Rooms, October 20, 1999, lot 245.